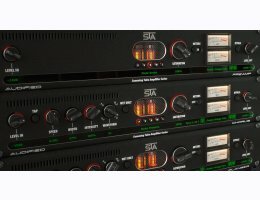 Set of summing tube processors that are also affordable. The STA Effects are based on STA (Summing Tube Amplifier) technology that uses two signal paths. One of them is processed by modulation or spectral change and the other is clean. These two signals are mixed on a vacuum tube. Audified have added a brand new plug-in, STA Delay, so STA Effects now contain Preamp, Chorus, Flanger, Phaser, Enhancer and Delay. The internal processing has been improved. Audified changed the operation points to achieve better Saturation results and also improved the GUI significantly, so that the users get better access to all functions and newly added controls. Believe it or not, the single knob of STA Preamp can give your mixes some extra value. Choose one of three types of tubes and control amount of saturation. STA Chorus adds your instruments a little warmth and tickeling vibe! Extra punch, meat, juice... Call it what you want, but STA Flanger gives it to you. If your sound is not spacey enough, take it to the universe with STA Phaser! And last but not least - STA Enhancer will make your mixes beautiful and bright. And now in version 2 you have a new STA Enhancer to brighten your sounds and a STA Delay to add rhythmic depth to the tracks. Major GUI update with Retina support. Algorithms operating point can be calibrated between 0 and -24 dBFS. Level In and Level Out parameters added so you can easily adjust signal level to reach - desired saturation. Audio Unit mono to stereo ability added. Mac: Old OS X support dropped, at least OS X 10.9.5 is required. Pro Tools advanced shortcuts functionality improved. Pro Tools Audio Suite functionality improved.